ROME (AP) — When Napoli coach Carlo Ancelotti looks at Paris Saint-Germain, he sees a squad transformed from when he became the first big-name hire by the club’s Qatari owners. “There are many differences. Back then the squad was still being constructed. Whereas now the project has reached the final phase — winning the Champions League. PSG is now among the best squads in Europe,” Ancelotti said Monday, a day before Napoli hosts PSG. Ancelotti led PSG to the French league title in 2013, the first of five championships in six years. With a squad featuring two of the world’s top players in Neymar and Kylian Mbappe, the only cup missing for the big-spending Qatari owners remains the Champions League. Having also coached Chelsea, Real Madrid and Bayern Munich in recent seasons, Ancelotti raised some eyebrows when he returned to Italy for this season with Napoli, a club that hasn’t won Serie A since Diego Maradona led the team to its only two titles in 1987 and 1990. While challenging eventual champion Juventus in Serie A last season, Napoli looked like a poor shadow of itself in Europe. Last season, Napoli finished third in its group behind Manchester City and Shakhtar Donetsk and was relegated to the Europa League. Previous Napoli coach Maurizio Sarri openly discussed his preference for Serie A over the Europa League and the Partenopei were promptly eliminated from the second-tier competition by Leipzig. 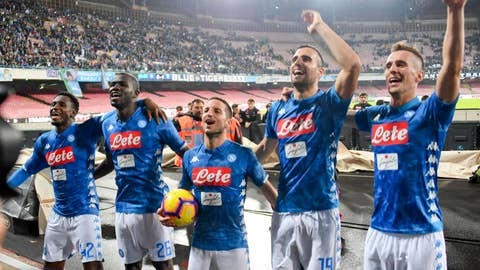 Ancelotti has restored Napoli’s pride in Europe, as evidenced by a 1-0 win over Liverpool and a 2-2 draw at PSG two weeks ago in a match that Napoli dominated. Liverpool leads Group C with six points, followed by Napoli with five, PSG with four and Red Star Belgrade with one. In a match featuring an unusually high number of connections between former players and teammates, PSG goalkeeper Gianluigi Buffon will mark his Champions League return after a three-match ban in his native Italy against Ancelotti, who coached him at the beginning of his career at Parma. PSG striker Edinson Cavani scored 104 goals for Napoli in all competitions between 2010 and 2013 — good for fourth on the club’s all-time list — and is now PSG’s all-time leading scorer with 176 goals. What’s more is that Cavani’s two sons still live in Napoli with his former wife — and the boys support Napoli. Cavani has been nursing a slight muscle injury but is expected to play, amid reports that he is considering a return to Napoli for next season. Angel Di Maria, who scored PSG’s late equalizer in the first meeting with Napoli, won the Champions League under Ancelotti at Real Madrid in 2014. PSG midfielder Marco Verratti was a teammate of Napoli striker Lorenzo Insigne when they won Serie B with Pescara in 2012 — a season in which Insigne scored 18 goals and created 14 assists. Promoted to more of a pure striker role under Ancelotti in a 4-4-2 formation, Insigne has thrived with nine goals in 13 matches in all competitions this season. Ancelotti had been using Mertens in a bench role. “The truth is that it’s difficult to leave out a duo like Insigne-Mertens,” Ancelotti said.